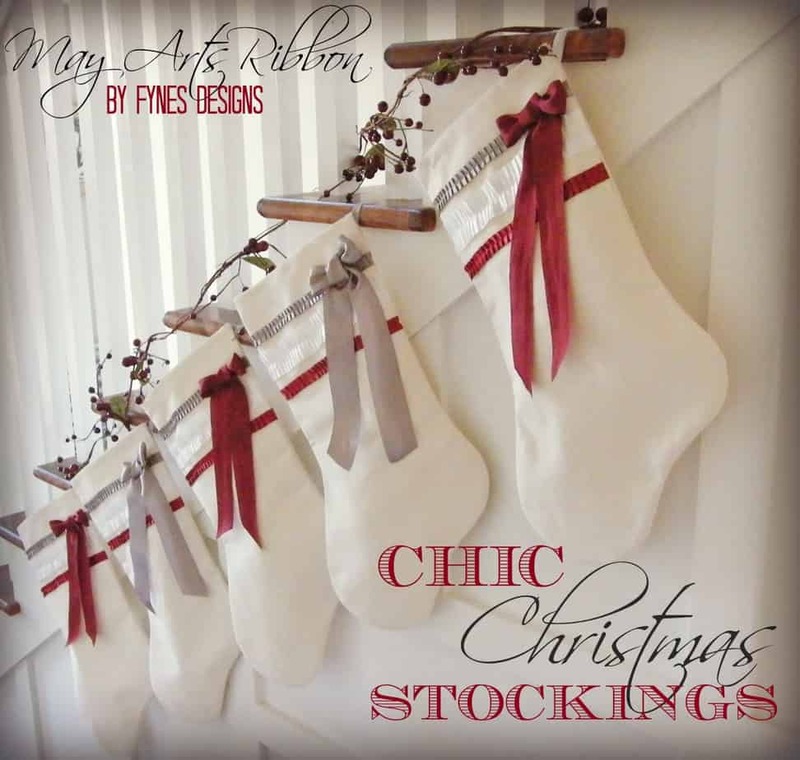 HO HO HO, thanks for HOpping on over to Fynes Designs today! I’m so glad you’ve joined in on the fun, you won’t be disappointed with all the Christmas inspiration us Ribbonistas have to offer! Your job? Comment on any post along the (all week long) to win some ribbon to call your own! Enjoy! I’ve created these beauties using canvas and a few of my favourite ribbons. What better way to display some of my favourites than front and centre of these Chic Christmas Stockings fit for a family of five! These stockings are made from light weight canvas. I chose canvas because it has good structure and wouldn’t create a floppy stocking, plus it was only $4.99 a meter! The beautiful ribbons are 5/8″ Satin pleats, 1.5″ Satin Pleats, and 1.25″ Silk for the bows. All of these ribbons are available in a wide range of colors sure to suit any color scheme you use in your holiday decorating. Thanks for stopping by today! These are just gorgeous. I love the crisp white you chose…the scarlet ribbon plays off it so very well. Drool-worthy. I’m going to pin them on Pinterest, I like them so much! oh these are Beautiful. I love all that ribbon you used too. So pretty, love those stockings! 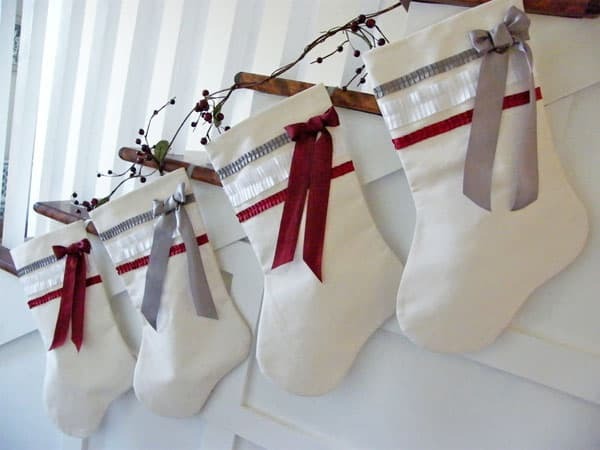 Your stockings are so gorgeous..and the canvas trimmed with the ribbons is a great combination. Thanks for sharing that idea. Beautiful stockings! They are so elegant looking. Awesome. Simple and very elegant. Love the colors you chose. Just beautiful. 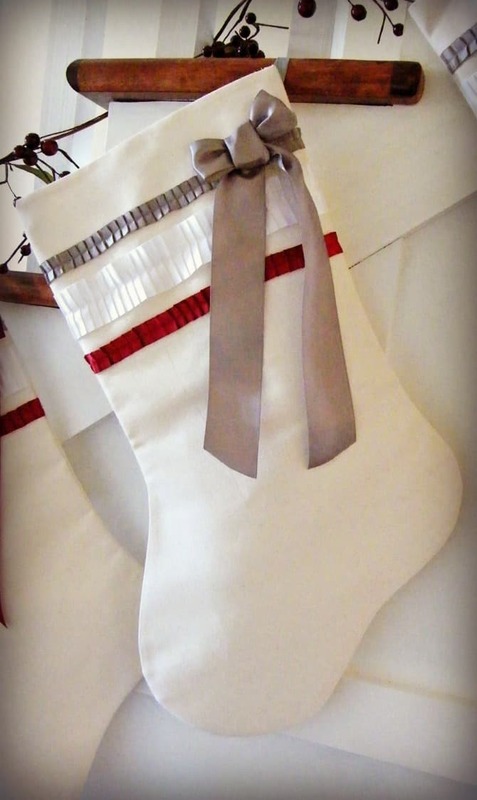 Love the white stocking trimed in sliver and red. TFS. “Chic” is right! Your stockings are just BEAUTIFUL!!! TFS! Are ;you going to find a black cat in one of your stockings? I’m sure he’s very inquisitive about what those are. The stockings are very pretty. These are so pretty and elegant–love the cat too! The stockings are so pretty and colors of the ribbon pleating make them look so classy! LOVE these stockings! So CAS and elegant! Aren’t the preruffled ribbons the best? Wow, Virginia these are LOVELY stockings!! You have such classic taste – and amazing talent! Such pretty stockings. I love that you used red, white, and silver. These are great and I can see either stamping the names down the ribbon ties or embroidering them on them too. Thanks for sharing! This i totally love. the best stockings decor I’ve seen. 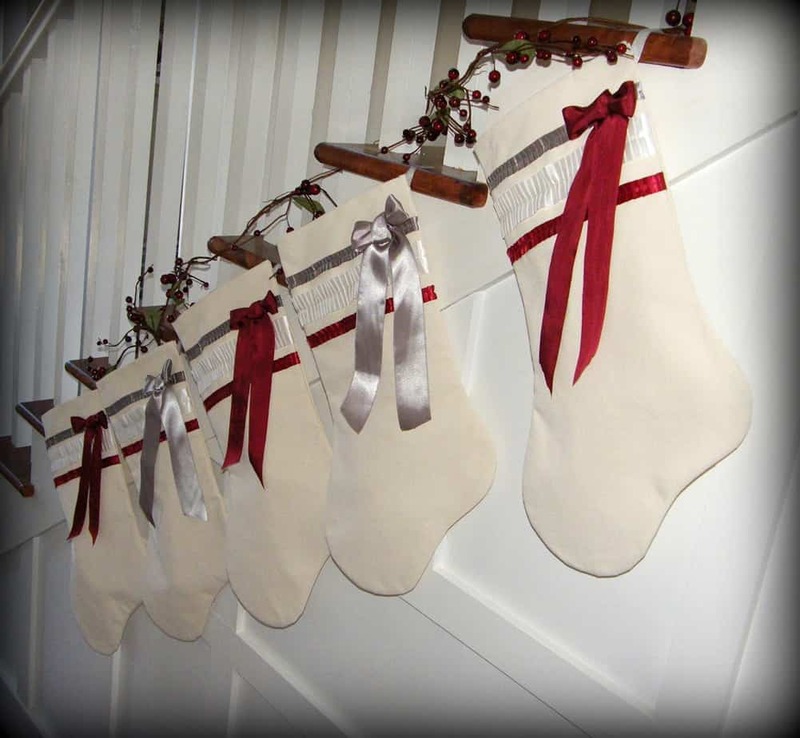 Beautiful stocking decor…absolutely the best i’ve seen. Love your style–those stocking are gorgeous in their simple, streamlined way. Very elegant. They coordinate so well with each other. How nice. I used the same pleated ribbon but in black for my wreath! Its so pretty. I love this idea. Off to order more colors. Lovely and so fun and creative!